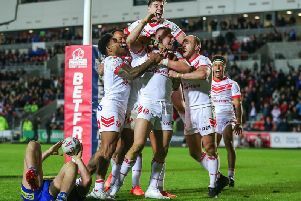 Substitute forward Alex Walmsley grabbed two tries as St Helens overcame 12-man Salford 30-4 to effectively seal their place in the Betfred Super League semi-finals. A third successive victory snuffed out Wakefield’s lingering hopes of a top-four finish and lifted Saints up to third place with a healthy points difference, leaving Wigan likely needing to win by an improbable 90-point margin in their final Super 8s fixture. That comes at Wakefield on Saturday and by then, if Hull have taken at least a point from Castleford on Friday, their season will be effectively over. Salford battled hard despite the 37th-minute dismissal of forward Ryan Lannon for a high and late tackle but finish a season that promised so much with a ninth defeat in their last 10 matches. The Red Devils made the better start, though, with former New Zealand Test winger Manu Vatuvei catching the eye with a strong burst before full-back Niall Evalds cut through for the game’s opening try straight from a well-worked scrum set move. But the home side paid the penalty for a series of handling errors from their slipshod threequarters which enabled St Helens to build up a head of steam. Pressure on the visitors’ line told on 16 minutes when Saints’ marquee full-back Ben Barba slipped the tackle of Kris Welham to give centre Mark Percival a clear run to the line for an equalising score. The turning point came 10 minutes before half-time when Vatuvei was denied a try by video referee Phil Bentham for a knock-on in the build-up to a smart attacking move and a minute later prop Walmsley crashed over for his first try. Walmsley was then placed on report for raising his elbow in the tackle, a decision which enraged the home supporters, who were further incensed a minute later when Lannon was dismissed for an ugly challenge on half-back Theo Fages. Percival provided the only other points of the first half with a conversion and a penalty, awarded following one of a series of skirmishes as the game threatened to spin out of referee James Child’s control. Salford defied their numerical disadvantage to stay in the game for much of the second half, although it was Saints who continued to create the better scoring chances. Right winger Tommy Makinson went close to touching down Danny Richardson’s lofted kick to the corner and left winger Regan Grace crossed at the other corner only for slow-motion replays to indicate a foot in touch. It was no surprise when Saints finally increased their lead, second rower Zeb Taia taking Fages’ pass close to the line to grab their third try on 62 minutes and Percival kicked his third goal to open up a three-score lead. The powerful Walmsley romped over for his second try 10 minutes from the end before leaving the field with a head injury while Barba put the seal on an impressive display with Saints’ fifth try in the last minute.